This review marks a change in strategy for this website. Until now, all components tested were either owned by me (yes, I’ve had an awful lot of components) or property of friends who let them stay in my setup for a while. This time, the component under review was supplied by the distributor with the explicit purpose of reviewing it; not buying it. This was decided because of the current rapid turnover in computeraudio products. I simply cannot buy each and every computeraudio component that comes out these days. But the products are becoming more and more interesting almost by the day. Therefore I want to be on top of this new and exiting product section as much as I can and continue to provide meaningful reviews so that you, dear reader can make solid decisions. I feel that I had to make this clear beforehand as it may imply that my reviews will no longer be impartial or objective. Please let me assure you that this will still be the case: I intend to always write down what I hear, good or bad. Simple as that. To make it very clear which components were not owned but supplied for review, I will always indicate this at the top of each review in the shape of a link to the supplier. Now, on with the review! 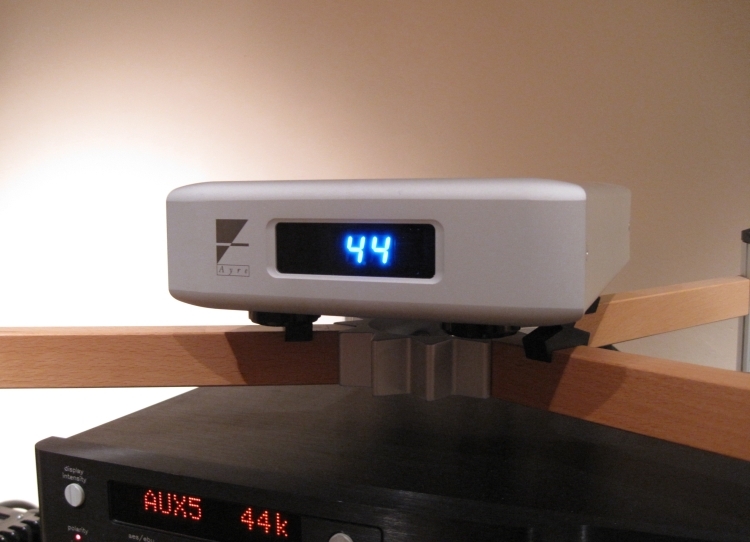 Even though I was warned by the distributor that the Ayre needed plenty of warm up time, the dac was only warmed up for one night before initial listening began. Once again, Christiaan just couldn’t control his curiosity! 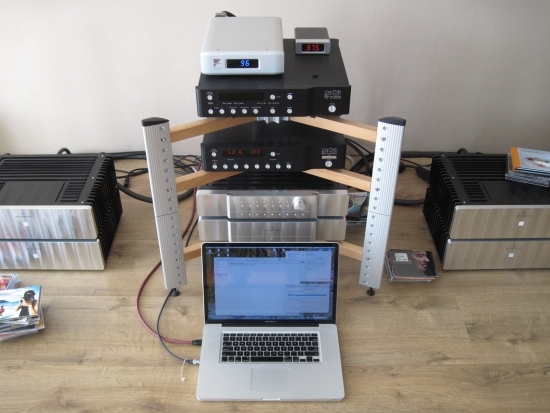 Connected to my Macbook pro via a Transparent USB cable, placed on top of the Spider rack, on top of the Levinson 390S cd player and using the latter’s Harmonic Technology powercable and Transparent interlinks I fired up the Ayre just to get a first impression. I played back 96k LP recordings that I had made on the Macbook pro and used iTunes natively (without any add-ons, such as Amarra) because I felt that this brought only technical improvements, and in fact taking away fullness and colour that the Macbook was already lacking, compared to the Full size PC. It had only had one night of warm up time and had previously been stacked unconnected for a long time. So naturally, I wasn’t expecting fireworks. Initially my fears were met: sure it was plenty open and detailed but the sound was also slightly thin and lacked foundation and colour. Additionally, it sounded decidedly digital. Not aggressive or harsh in any way, but just not very natural, a tiny bit square if you will. Not “analogue”. In comparison, my Levinson 360S dac, connected to the Macbook pro via a midclass Toslink cable, sounded much fuller in the bass, richer in colour and also more relaxed. But I also noticed that the Levinson was less detailed and airy, less articulate in the bass and overall more relaxed in its presentation. But I do like relaxed:-) So, for a first impression, considering that the dac has hardly had enough warmup/playing time, results are already pretty good. So I decided to just let it play some more, meanwhile switching back and forth between Ayre and Levinson. In the temporary setup, pictured above, with the Macbook Pro I had now switched back and forth between the Levinson and the Ayre many times and had established an overall feel for what I liked and disliked about the Ayre. I found that the Ayre was exceptionally well-detailed while avoiding any harshness or forwardness. Its midrange is crystalclear and communicative, but without any clinicality, like the Weiss had had. The Ayre’s PRAT and articulation was better than the Levinson’s but it was also less relaxed, less mellow and colourful. The Levinson excells in these areas, being very much full-colour. By now the third LP was playing and I was doing the dishes when I suddenly felt emotionally connected to a ballad that was playing. I turned to the preamp and noticed that it was the Ayre that was playing. Quickly I changed to the Levinson, only the notice that the emotion actually diminished! The Levinson still sounded more colourful but its speed was somehow off, compared to the Ayre which sounded more on the beat which made me think of the matter of synchronous/asynchronous data handling. There might be something to it after all. At this stage, I would almost call it a tie between the Levinson and the Ayre with the choice between the two coming down mostly to taste. This is already high praise, considering the difference in price between the two dacs. Still, the Ayre’s musicality is very music-dependent. I find that with some music it simply excells while with other music it is merely okay. But I haven’t done any comparative testing with the various playback applications yet, the Ayre is hardy warmed up nor run in completely, toslink is absolutely not the connection method of choice, nor is the Macbook Pro as good a source as a proper full-size computer. The latter is documented elsewhere on this site, but in short I feel that notebooks sound thinner and less colourful than full size computers. Therefore, I will do more listening in various circumstances, using both Mac and PC for source, trying more playback applications as well as a collection of add-ons for iTunes. In the meantime, let me get you up to speed with the particulars of the Ayre QB-9. 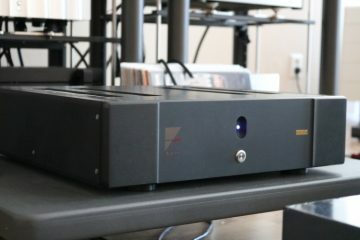 The Ayre QB-9 is the very first USB computer audio dac that makes use of the so called “Streamlength Asynchronous Audio Protocol”, developed by Gordon Rankin of Wavelength Audio. This technique makes it possible to slave the computer to the clock inside the dac. Not the other way around, which is usually the case. the ultrastable clock inside of the Ayre is now in control of the timimg of the datastream which reduces jitter by a factor 100! In addition, Ayre makes use of a special type of digital filter which is applied in a Xillinx FPGA, called “Minimum Phase” (MP). In short, this filter completely avoids pre-ringing and its resultant time-smear which is inevitably always present when using the more common (linear phase) brick wall filtering. As a small course through history, Ayre’s first filters used what is called a “slow rolloff” filter for the steeper the filter (brick wall), the more ringing it will cause. Therefore, slow roll-off filters were used to achieve only small amounts of pre- and post ringing. This kind of filtering (or at least similar) is also used in some other products like Wadia. But Ayre acknowledges the resultant downsides of using slow rolloff. Most obvious of which is an increasing loss of high frequencies, up to -3.2dB at 20khz. This is what has always bothered me about Wadia, no matter how lively, 3D and solid the players sounded, I could never completely get over that lack of HF air. Not content with this state of affairs, Ayre sought for a more elegant solution. Peter Craven came up with a clever solution called Minimum Phase. What this means is that the phase varies with the frequency but there is no longer any pre-ringing whatsoever. There is post-ringing though. In fact, all previously existing pre-ringing is now moved after the transient, where it sounds much more natural. Remember: pre-ringing places an echo of the sound that is yet to be played. Moving this to after the transient makes much more sense. But there’s more to the QB-9. Like a super-stable clock, a stable and clean powerdupply, an optocoupler-separated USB input and a discrete, fully balanced analog output stage that is completely free from global feedback. According to Ayre, the result is the most musically natural digital playback today. Of course, technical details are not everything and, as always, the proof of the pudding is in the eating! Using both Mac and PC, various interfaces for comparison and a variety of playback applications. 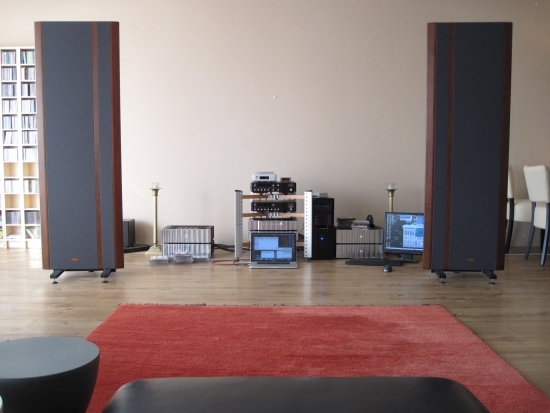 Above is the review system in its entirety: Magnepan MG3.6R magnetostatic speakers, Jeff Rowland Model 6 and BPS 6 poweramps and battery power supplies, Jeff Rowland Coherence II battery powered preamp, Mark Levinson no.390S CD player, Mark Levinson no.360S DAC. I use Transparent Reference XL series cabling throughout, both Ultra XL and Reference XL. The PC is not normally placed next to the system but at the other end of the room, connected via a very long RG59 coaxial digital cable. In this case I wanted to create equal circumstances and thus placed everything next to the system so that I could use the same Transparent USB cable and Wireworld Gold Starlight III+ coaxial digital cable. Above: The Ayre was also listened to sitting on its own private Spider Level. This turned out to make a HUGE difference when compared to it being stacked on top of the Levinson. I used both a Macbook Pro and a full size PC running Windows XP. All methods at hand for getting audio out of the computers were tried, both internal PCI card and external interfaces. I used toslink, s/pdif coaxial and USB for data transfer. This was a neccesarily extensive comparison as I wanted to pull all the stops, evaluating the Ayre as well as finding out how it compares some other methods of computer music replay. 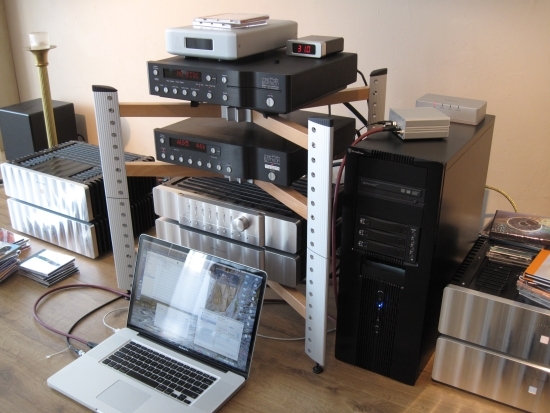 Simultaneously to this review, I conducted some very elaborate comparisons between Mac, PC, the various music playback applications and their add-ons, as well as comparing the Ayre to Arcam’s rDAC and M2Tech’s HiFace EVO in combination with the Mark Levinson no.360S DAC. Since this review deals with the Ayre QB-9 specifically, I will minimise the mention of these comparisons. For the remainder of this review, music consisted of 4 carefully selected WAV files (see the “music used” box below), ripped from CD with iTunes, then copied via the network to the PC. Also used in a later stage were various 24/96 LP recordings that I had made myself. Playback was always in native samplerate, no upsampling used, and always using Wave Out (not Directsound) with the most direct route in the playback app’s settings. This means using kernel streaming if available. FLAC conversion and playback was also tested but is discussed in another section below. In all cases the same digital coaxial cable (Wireworld Gold Starlight III+) was used and was swapped bewteen EVO, Ayre and EMU. The same goes for the USB cable (Transparent Performance). 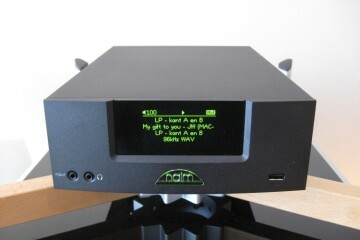 The same interlink was used into the same preamp inputs. Even though I have two sets of the same interlink, they are different lengths and do sound different, therefore I continually swapped the same interlink. To make the comparisons even more honest, I used a crappy powercord for the PC, in order to bring it closer to the simple wall wart powersupply that the Macbook uses. All components were well-warmed up and always switched on and active at the same time during the test. I can imagine that you’re getting impatient by now, dear reader, so would I! Okay, so enough techno babble, enough with all introductions and word-mincing. Down to business, getting on with it. Finally eating the pudding. Ah yeah, the pudding. The proof was in the eating right? The same goes here. No matter how much technical explaining you do, there is no way to prepare you for what you will be hearing with the Ayre QB-9 once it is properly run in, carefully setup and connected to the playback system of choice, running the software playback solution of choice. I’ll break the tension right here: the Ayre QB-9 sounds nothing short of totally and utterly un-digital. Un-computer-audio-like. In fact, it sounds a lot like a true highend cd player. But before I continue laying out its precise sound character, I need to explain a little bit about the rest of the system. It truly is, but only if you set it up correctly. Even though this part is extensively covered in a computer audio knowledgebase article elsewhere on this site, where I compare the Ayre to a variety of other playback solutions as well as comparing a Macbook Pro directly to a full Size Windows PC, let me just say that my initial listening was done with the Macbook. It was this combination that gave me mixed feelings about the Ayre. 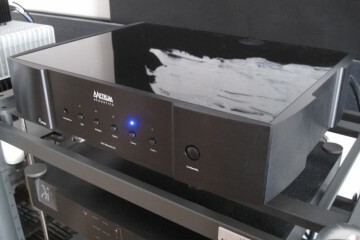 On the one hand I heard some aspects that were clearly better than my Mark Levinson no360S DAC being fed by either the internal EMU1212M soundcard’s digital coaxial output or the HiFace EVO USB interface’s digital coaxial output. But on the other hand, compared to the Levinson, I kept missing colour, fullness, natural glow and soundstage width and envelopment. With some music the Ayre sounded utterly engaging as it has splendid timing, openness and transparency. But with the Macbook Pro as a source, it didn’t totally convince me, no matter what application or plug-ins and add-ons I used. As a side-step, this brings me to assuming that a Mac Mini would also not be the best choice since it is basically a Macbook without display. That would be a shame since it is a very neat solution. Assumptions aside, I already knew that the Macbook Pro wasn’t the perfect playback device for me to start with so I wasn’t surprised. Using it with the EVO or optical output didn’t help. Well, the optical output straight into the 360S dac made for a fuller presentation with more colour but it clearly impeded rhythmic flow and was ultimately much too rounded off, both dynamically as well as timing-wise. but I digress. The point is that the PC sounds so much fuller, so much more dimensional as well as more fluid, richer, gentler, more real, more musical, more… like a real cd player! I’ll let that sink in. Many people have been claiming this before, even stating that their coputer solution sounds much better than their cd player. But as regular readers know, I’ve always held that “better” usually implied more forward, tighter, technically more accurate. Correct. But more musical? Despite my sincerest efforts I’ve certainly never heard evidence of this. Until now. I don’t know whether it is the no feedback output stage, the MP filter toplology, the asynchronous principle, the super-accurate clock in the dac that make the computer slave to it instead of the other way around or a combination of it all, but I do know that now, for the very first time, I feel that computer audio playback has finally grown up and really can function as an alternative to a true audiophile cd player. But, to be totally honest here, the Ayre, in its best configuration, still didn’t sound like my Levinson no.390S for the latter still had the edge in fulness of sound, colour and sheer analogness of sound. I know that some people may think that this Levinson may sound analytical but it really doesn’t. In fact it sounds extremely colourful and rich. So, in this company, I still preferred my cd player. 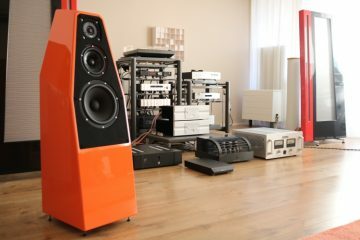 But make no mistake: the Ayre can be regarded as true highend, and is in the same class as the Levinson. It just has a different sound and I happen to prefer the lusher presentation of the 390S. Even though, ultimately, the Ayre has better layering, preciser soundstage and even more air. In fact, it may well have better low-level resolution that the 390S! Ayre is manufactured in the same region as Jeff Rowland. Would the two presidents know each other personally? I couldn’t say. But I can say that the nature of the Ayre QB-9 is probably best described as being similar to that of some of my favorite Jeff Rowland components. It has precisely the same virtues and vices. It is just uncanny. But I can imagine that many readers will not have heard Jeff Rowland components. It is easily summarised like this: the sound is completely free from artifice and flows freely between the speakers as well as around them and envelops you. At the same time the center focus is immaculate yet never forced and instead completely natural. Low level resolution is amongst the best I have heard but is never in your face or aggressive. Therefore some people feel that it might be less detailed than some moe forward or explicit dacs. I beg to differ. Speed is excellent and the sound isn’t slow nor too speedy but instead just right. The midrange is effortlessly musical: communicative but still free from boundaries and completely un-electronical. The treble is open and airy and absolutely never harsh. The bass is nimble, articulate and never overblown yet can be ever so slighly thin and lacks a certain physicality and fullness in the bass. All the descriptive text above refers to both the Jeff Rowland Cadence as well as the Synergy. But it also equally applies to the Ayre QB-9. But just like with the Rowlands, there are things you can do to minimise the lesser qualities while maximising the good qualities. I noticed that the Ayre became enormously more lively and also more powerful in the bass when it was placed from the top of the Levinson to its own position on the top level of the Spider rack. Please note that this was still with it sitting on the standard rubber Spider feet. When I put it on Ceraballs it really flew! Now the sound was incredibly open and detailed, slightly forward even, and the bass firmed up nicely. in fact, the Ceraballs were considered perhaps to be one step too far. Therefore I put 4 heavy Cerapuc feet on top of the Ayre to damp it. …This was ridiculous… All of a sudden the Ayre had bass aplenty and the entire presentation gained so much solidity that it was hard to believe. But it also took some of the Ayre’s natural easy and air. Sure enough though, this effect was doseable, with 2 Cerapucs providing an already better balance and finally 1 Cearpuc giving me the best balance between openness/air and bass/solidity. Above: When placing the Ayre on Ceraballs that were in turn placed on the top level of the Spider Rack, the Ayre’s sound is transformed. From relaxed and smooth to very open and dynamic and even a bit forward.Placing heavy weights on top can in turn smooth things down to an unbelievable large degree. Pictured are 4 Cerapucs on top but I ended with only one as 4 were too many for my tastes. Before I set this story off into the sunset… as always, there are some ifs and buts. Regular readers know how I love the Jeff Rowland sound. But they also know that Jeff Rowland equipment needs careful system matching. And this is where it gets important. If you are to get the maximum from the Ayre, make sure that you pay attention to the surrounding equipment. Choose your source carefully. Use high quality cables. And make sure that you place the Ayre on a good hifirack by itself, not on top of another component. And make sure to use a good USB cable. I compared the Transparent to a standard cable and couldn’t believe the differences. Just like Transparent interlinks, the USB cable provides more solidity, better and fuller bass, more colour and a more natural midrange and cleaner treble. I really wouldn’t use the Ayre with a lesser cable. If only the digital revolution would have provided us with perfect sound forever… alas, it is not so. Not even in the world of computers and USB connectivity. As always, in audio, everything matters. Just like when I first heard the Jeff Rowland Synergy preamp in my system, and I knew that I could never return to the Consonance preamp even though the Consonance had such nice bass, the Ayre shows me clearly what is wrong with my EMU soundcard, the HiFace EVO USB interface and ultimately, the entire s/pdif signal transport matter. I heard much the same when I finally bought the Mark Levinson no.390S cd player after having tried almost everything with separate transports and dacs. 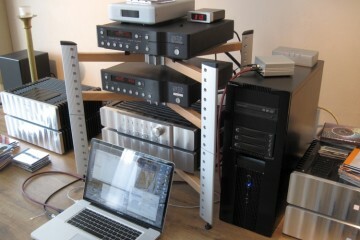 And this included the CEC TL-1x belt-driven transport and DCS Delius and Purcell dac/upsampler combo. The 390S was just much more musical and sounded more right. I never went back to separate transports and dacs. I fear that the same goes for computer audio. No matter what I try, the difference is huge. Using standard digital outputs from a soundcard, or by using the HiFace EVO USB interface, the sound can be very good, very exciting and plenty detailed. But you are never in doubt what constitutes the source. It is digital. But the Ayre finally gives me the much sought-after lack of computerness, digitalness or whatever you want to call it. The Ayre just sounds like music. Totally and utterly free from artifice. And for that, I am willing to forgive its slight lack of bass fulness. With the proper care and setup, you can minimise this while maximising its many virtues. And trust you me: its virtues will blow you away and spoil you for many if not all other playback solution currently available. Or at least, all solutions that I have tried and heard. An these are a lot! This setting uses the MP filter and is recommended by Ayre. All listening for this review was done in this position. I did listen to the “measure” setting but found that it was a lot less musical. Bass got a little tighter and ever so slightly fuller but the free flowing nature of the QB-9 all but disappeared and it sounded much more ordinairy. This setting uses linear phase and considering how awful it sounds, I can only assume that it was added to show how much better the Listen setting sounds! Just kidding of course, but take it from me, you won’t want to listen to the Ayre in this setting. It puts constraints on the soundstage, makes for a highly neutral yet flat and greyed out presentation, not even hinting at what the QB-9 can really sound like when using the listen setting. The QB-9 reviewed here is actually a first sample of the new batch that are able to play back up to 192khz sample rates. This is only possible by flipping a dip switch at the rear to enable the class 2 audio USB standard (dip-position Rsrv B) and using the appropriate drivers. As a side effect, the Windows system not only installs the driver for the Ayre dac itself (which was flawless by the way) but also finds the ayre acoustics dfu which as it turns out has nothing to do with actual audio playback but with a Device Firmware Upgrade. Apparently this isn’t needed with music up to 96khz and at the moment also not in class 2 audio, until an actual firmware update becomes available. In my case, every time that I connect the Ayre, Windows XP comes up with a screen that it has found the DFU but if you let it search for appropriate drivers, it finds none. On the Ayre website you can find info indicating that I can safely ignore this message but it doesn’t say how to get rid of it. When using the Ayre USB DAC, one advantage Windows has over Mac OSX is that the samplerate is automatically chosen according to the music played. It changes real time and you can mix all resolutions and samplerates in a playlist. On the Mac, you have to go to Audio Midi Setup and choose your preferred samplerate manually. Every time you play a song in a different samplerate, but also every time you switched off the Mac because it reverts to 44k. Keep this in mind because iTunes will gladly play a 96k file in 44k. It will just not sound as good as it should. 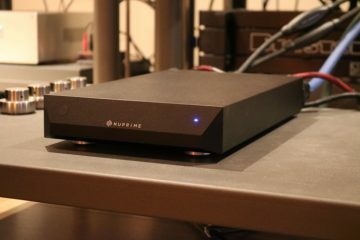 My gratitude goes out to Michael Huigen from Audiac, the distributor for Ayre in the Netherlands, for letting me review the Ayre QB-9. Michael is a very knowledgeable person (he has an engineering background) but also has a good set of ears and turns out to share many of my views regarding audio matters. we had similar test in iran by CEC TL0X and AMR DP-777 DAC. Macbook sounded so natural but a-little less dynamic than CEC TL0x. CEC TL0X easily outperform other transports. I have no doubt that the TL0X is fantastic, but I do not have it at hand:-) I have ownwd a ML360S and think it sounded very good, but ultimately a little technical. 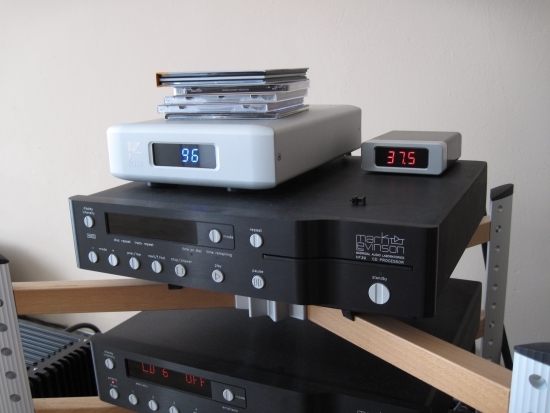 The ML390S CD player used integrally (not with an external DAC) was found to sound more fluid and ultimately more emotionally engaging, even if it had a little less resolving power. 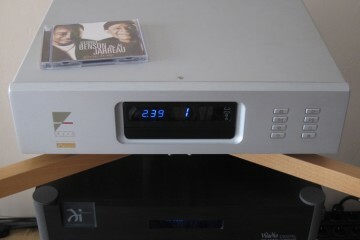 These days my reference is an Aurender N10 into a Wadia 521 DAC. Wish they offered some form of clocklink but alas. it is very linear and is exceptional at 5000$. Hi Amir, Thanks for the tip. I have heard a fully run in AMR DP-777 in my own system and while it was indeed very good on virtually all accounts, especially transparency and treble air, its timbre did not feel very natural to me. At the time I found the PS Audio PWD MK II, the Rowland Aeris and various Wadias to sound timbrally fuller and more convincing with piano and percussive sounds. 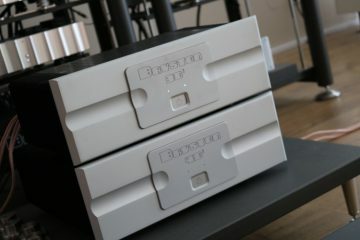 But that is in my system, with full range dipole Apogees, which tend to favour characterful sounding components. Also I am focused on timbre more than average so this is ultimately a pretty relative matter. 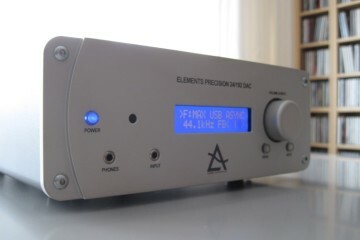 Hi Christiaan, I may have an opportunity to acquire an Ayre QB-9 DSD DAC in trade for a Conrad Johnson HD3 USB DAC. I realize you likely don’t know the CJ DAC but in the off chance you have an opinion about making this change, I’d be interested. Hi Gary, only having heard one CJ preamp I am in no way an expert on the brand, but from hearsay and reading reviews, I think I understand the CJ house sound. If their DAC has a similar sound (which may be so but is not a given) then you are comparing two very different sounding products and it just comes down to taste and to what you want to achieve. 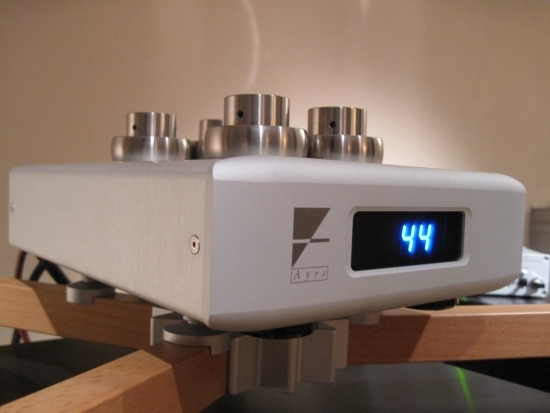 In general, the Ayre usually sounds airier and more light-footed than other DACs that I compared it to. Oftentimes also more refined. I think it is safe to say that the CJ will probably sound smoother but the Ayre will most likely sound more speedy and energetic. That’s all I can say without actually having compared them.